The polymerase chain reaction (PCR) is one of the most important molecular biological methods ever devised, with numerous applications to cli- cal molecular medicine. Since its description in 1985, PCR has undergone tremendous improvements, and many variations on the basic PCR theme have been published. With such a large volume of PCR-related literature, a clinical scientist wishing to use the technique will have a difficult task loc- ing the relevant information to implement it effectively. There is thus clearly a need for an up-to-date volume with detailed protocols to facilitate the setting up of those techniques most relevant to clinical applications. 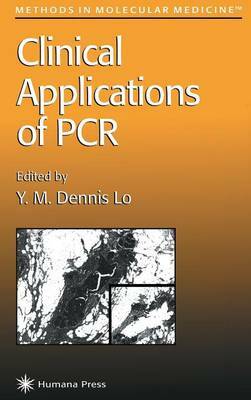 Unlike some other books on this topic, Clinical Applications of PCR includes only methods that are of direct relevance in clinical settings. The book is organized in three parts: an introductory section, a section on general methodology, and a final section with specific clinical applications. The first section covers the basic principles of PCR and is most useful to those new to molecular diagnosis. The next chapter includes useful tips for setting up a PCR laboratory. Section 2 then outlines some of the most commonly used PCR-based techniques in molecular diagnosis. Section 3 includes carefully chosen examples that represent typical applications of PCR in diverse clinical fields, encompassing hematology, oncology, genetics, and microbiology.